This hat is awesome. We've been experiencing blizzard condtions in MA this year. I've been able to get out there and clear the snow while being seen from a mile away. I measured my head and found it to be around 24" so I bought a 2XL. It was a little loose until I discovered the snugging strap in the back which is an great feature and which pulled it in nicely. Fur feels very nice. I actually had to take it off when the temperature got up in the 20's! I will definitely get another one in black when available. I purchased this hat for my husband as an anniversary present. He had really wanted a Mad Bomber Aviator in the Blaze color and I wanted to make it happen. Everywhere I had searched everyone was sold out the the Mad Bomber in Blaze X-Large. However, I came upon FurHatWorld.com and they had it and in his size. It wasn't the Mad Bomber brand but I was willing to try it out. I tell you I am amazed at the quality of the product. I will purchase again. I wore yesterday the shapka to work at the parking lot. I work in exterior and I need that the drivers are looking to me very well. I bought this mad bomber or shapka for two reasons: the safety and protection with the visibility and the warm to my head. Yesterday was cold and the shpaka protected my head, very well. But remember you have what tou pay. 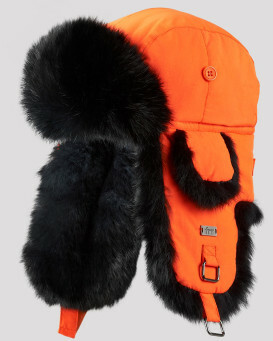 I will expect the coldest times to wear the mad bomber. Is pretty and elegant. Thank you to Fur Hat world. Best winter hat I've had in years! Very warm and good fitting (used the size chart). I'm not sure what the buttons on the flaps and hat are for- as there are no button holes to put them in. But the only thing I wish they would have done was to make the chin strap a little heaver and longer. It works fine, but it could be better. The hat should last me for many winters! It is a well constructed and very warm comfortable hat. It is not too heavy in weight which makes it ez to wear. The only negative thing about the whole experience was the long shipping time that it took to get here from Canada. All in all at the end of the day I like it and would buy from here again- just keep in mind the long shipping time if you are ordering for a present or something where you need it quickly. We love our hats. We bought the bright orange with black fur, because we are Bengals fans and they are perfect for the games. Perfect because of the color and perfect because they are so warm and comfortable. They are well made and the fabric is of high quality. They are so nice that we are ordering one for our son for his birthday. He's a Bengals fan too.....Go Bengals! I recieved prompt order processing and delivery. When I got my hat I was not disappointed. The blaze orange was actually blaze orange. The materials used and craftsmanship are next to none. I bought this hat to wear hunting. It's very warm, keeps the wind out and fits very comfortably. I would recommend this hat to anyone. Thanks Fur Hat World! Great product! I bought one black, leather, aviator hat. When it arrived, it was so nice,and warm, my wife wanted one. So we bought a brown one for her. Then I got thinking, it would be nice to have a floresent orange one for hunting. So my wife bought that one for my next birthday present. I think we are done buying now! But wait, these hats would make a GREAT Christmas present for my son, and daughter-in-law. You will probably be hearing from me again! I bought this hat for my Granddaughter, I am giving it to her for Xmas. She is 16 yrs and I know she is going to love it! I have bought her several different styles from Fur hat world, and she loves the quality and cuteness of them. Love shopping with these people. Thank you. Best thing is it fits! I have a big head and its nice to find a hat thats comfortable. My Blaze Orange touques always pulled off when going through brush when hunting rabbits. This does not. Sometimes its too warm but this is not a complaint. Maybe some ventilation would help? Good quality hat, just like the other leather Aviator hat I purchased a year earlier. I've not used it yet, just waiting until my elk, bear and deer seasons. There's no doubt it will be outstanding. I only gave it a 4-star because I've not proven it yet, we'll see soon. perfect for this winter and for walking the dog. prdered a large since that corresponded exaclly with my head size...wrong. a quick call fixed it and after a few days The L was credited back included shipping and the XL was on my head. Quality and customer service EXCELLENT. The colour of this hat is outragious orange - my son loves it. This was my second order from Furhatworld and it involved a return. They are very prompt in making a refund. Overall, very pleased and plan to do one more order for my own fur hat...maybe beaver this time. I bought this hat for my husband for Christmas. He will be using for an upcoming hunt in Colorado. He was so excited when he opened the package. The hat is very well made and very warm. He is bragging to all his hunting buddies on how he will be warm and they won't! I think they might be purchasing their own. I purchased this hat for my husband for Christmas since he works outside a lot in the winter. The fur is thick and it is very good quality materials and the fact that it is his college colors made it perfect. I couldn't pass it up and they shipped it very fast. I would have no problem ordering from them again. I bought this hat to use as a ski hat. I bought the orange so I would stand out from the crowded mountain for my friends to find me. The orange is easily visible but not an obnoxious color orange. It is super warm. The fur is amazingly warm. The buckle strap is easy to use even with gloves on. Much better than trying to tie it. Highly recommended. Warmest hat ever for zero temps in a treestand. Rating based on difference of hat sizes. We had to return the extra large as it was way too big. The large is too snug but we are keeping it in hopeps it will stretch a bit over the winter. Return was quick! you just can't go wrong with this hat: it's very warm, comfy, and it is certainly affordable. I tried this hat for -30 for about 2 hours and it kept me warm with no problems whatsoever. This is my second aviator hat from furhatworld. Top quality product. If you are having second thoughts about purchasing one...go for it you won't be disappointed. walking the dog daily in this wicked winter adds up the need for this hat...warm and well made. Plus this is deer hunter haven (Bucks Co) and I feel safer in this color. I work as a crossing guard for the city of Wichita Falls , TX .This hat is the perfect fit and it is very warm . Also it is a bright orange color which makes me more visible to the motorists . Bought two for spouse and self. Better than anticipated - great fits (also appreciated the web support-person who helped to clarify what sizes to buy) and very well constructed. Would definitely buy again!